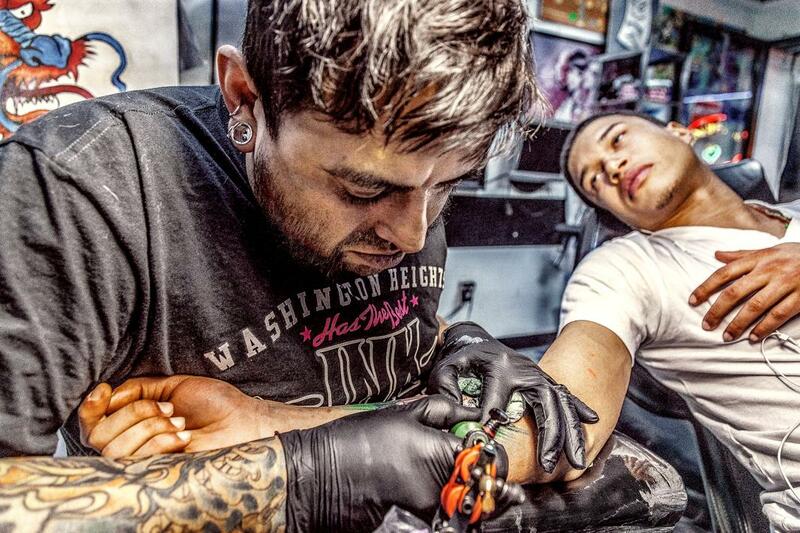 Getting a tattoo can be a pretty grisly experience, but there’s also beauty in the delicate, often meditative encounter between a tattoo artist and customer. 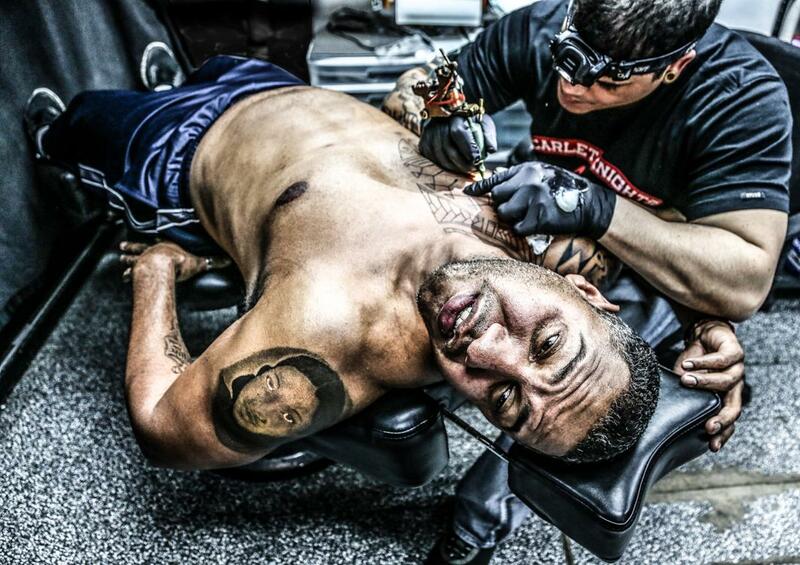 Anne Burlock Lawver highlights both the agony and the serenity of tattooing in her series “Indelible,” which comprises more than a year’s worth of photographs from a single Washington Heights tattoo parlor, Gunmental Tattoos, which has since closed. 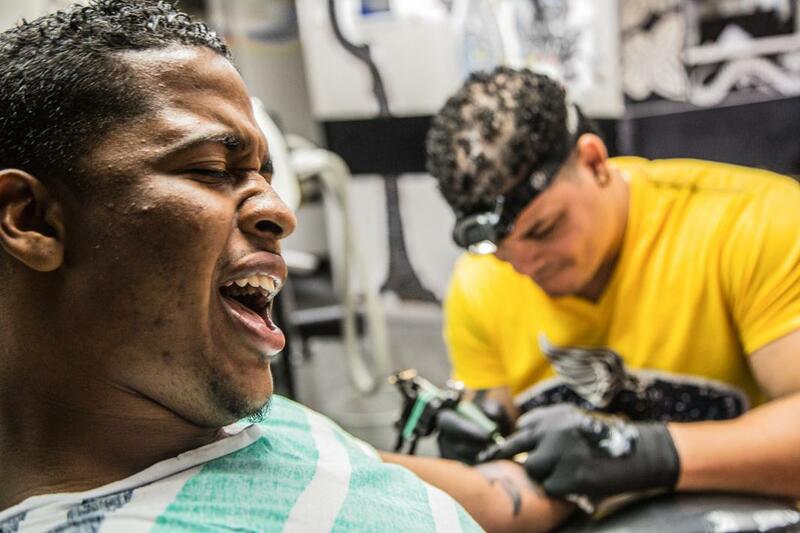 Lawver started shooting in Gunmetal Tattoos in 2013 after receiving an introduction from the owners of a neighborhood barbershop she’d previously photographed. Lawver doesn’t have any tattoos, but she was curious to learn more about why people get them and uncover the nuances of a process frequently only associated with pain. Indeed, as Lawver photographed, she found that the moments of pain she captured were far less frequent than the moments of calm. “The beauty I saw and tried to convey through my work was both the physical beauty and emotional beauty of the individuals during their private experience,” she said via email. The light was pretty dim in the tiny shop—a single room divided into a small reception area and the artists’ work area—so Lawver experimented with the “Exposure” and “Clarity” sliders in Lightroom to bring out more detail in her photos. The resulting boosts in graininess and saturation, Lawver said, help communicate the intensity of the tattooing experience. For Lawver, taking the photos was a similarly intense experience, one she likens to photographing in a surgical operating theater for its potential hazards. Bumping into an artist, a customer, or a piece of equipment was a constant danger, but Lawver found that if she moved carefully and kept focused, the rewards could be great.